The REALTOR® Building is located in Northeast Albuquerque on University Boulevard between Menaul and Indian School. The REALTOR® Building is within short driving distance and easy access of two major freeways—Interstate 25 and Interstate 40—and provides a professional business environment in a convenient location, making it ideal for your next meeting, workshop, training class, or event. The REALTOR® Building was designed with education and professionalism in mind. The business professional setting is conducive to achieving the goals of your next meeting or event. Classrooms can accommodate up to 40 people classroom-style, and 60 people theater-style. Soundproof wall partitions divide the 3 classrooms and can be opened to create a larger meeting space for seating 120 people classroom-style, or 200 people theater-style. 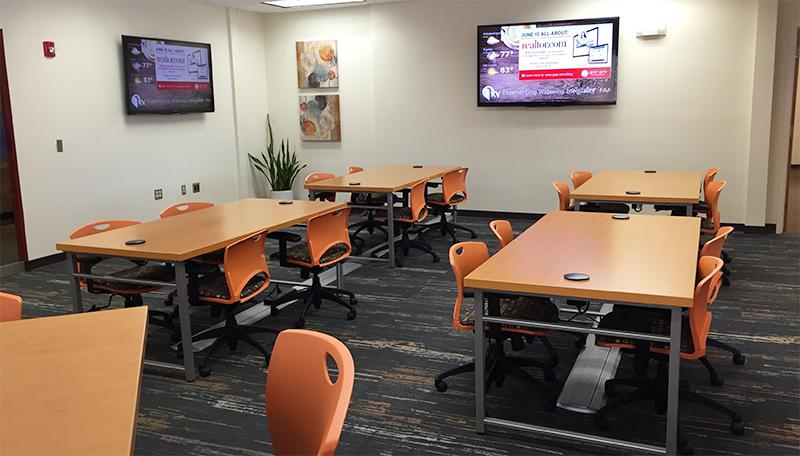 Each classroom features one large whiteboard, pull-down projector screen, and ceiling mounted LCD projector with HDMI input capability. Join us in the new Open Door Internet Cafe, your home-office away from home, complete with conference rooms, lounge areas, hot tables and high-speed Wi-Fi. Our multiple conference rooms vary in size and can accommodate seating for 4 to 20 people. They are ideal for small meetings, interviews, and breakout sessions. GAAR staff members take pride in offering world class customer service. Your event attendees will receive superior customer service from the beginning to the end of your event. Prime location, information services, and a friendly smile are just a few benefits of holding your event in our professional environment. To keep your audience comfortable during your rental experience we offer on-site beverages. Please inquire to get a full list of available options. You are encouraged to preview the facility and discuss your event needs with the staff contact.